Naturally a trip to Woodland Mountain was in order with all our glorious freshly fallen snow! Students took sledding to a whole new level as they careened down the path, built up banks and created a trail! Inisde our cozy school some students opted to work on sewing projects. Cutting fabric, learning the “candy cane” stitch, threading needles, drawing and implementing their designs, all this fine motor skill work takes oodles of concentration and tenacious attitudes as projects spanned several days. Making snow balls and rolling them in to the brook kept other students busy as they played around with trying to break through the ice that had formed along the brooks edge and creating a snow dam. Simple Machines, our latest Journey of Discovery, began this week. Through videos, group experiments, and hands on exploration, Woodland students are learning about the ways simple machines make Work (w) easier for us by changing the amount of Force (f) we need to move, lift, or carry an object even though we may need to move it a greater distance. The new fallen and heavy snow gave us the perfect opportunity to demonstrate how inclined planes (a simple machine) can help us to lift a load, that we had no chance of lifting on our own, to a new height! I'm sure you've seen our massive snow people out on the front playing fields! Our ramp, or inclined plane, helped us to get those massive and very heavy snow person body parts to their spot. This was a group effort as we first tried to lift the snowballs on our own (impossible!) and then fixed our ramp and found that, working as a group, we could push the balls up the ramp. The pulley was the next simple machine we explored. 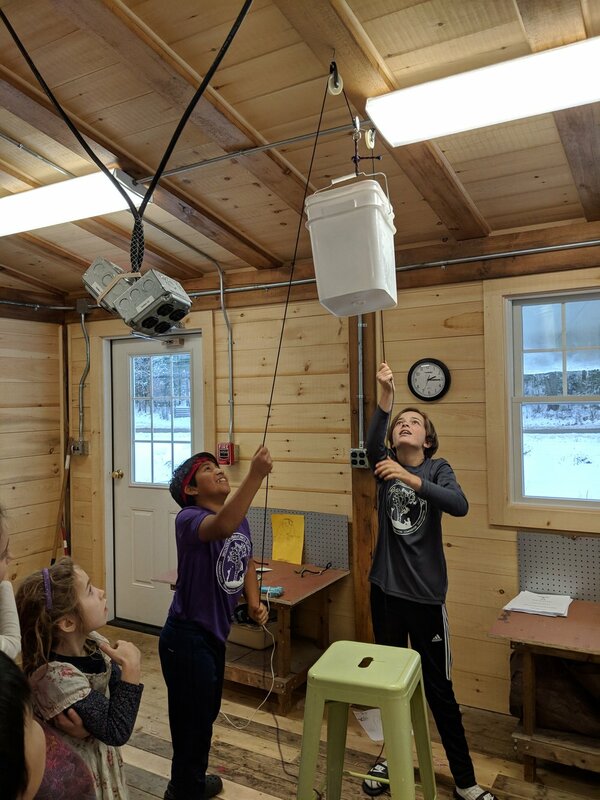 After getting some basic info about a pulley, students were asked to create a simple fixed pulley out of whatever resources they could find at school. Students got to work and created some truly fantastic models. The next day, students were challenged to create a pulley system to lift Delilah the Diving Elephant up to her diving platform. 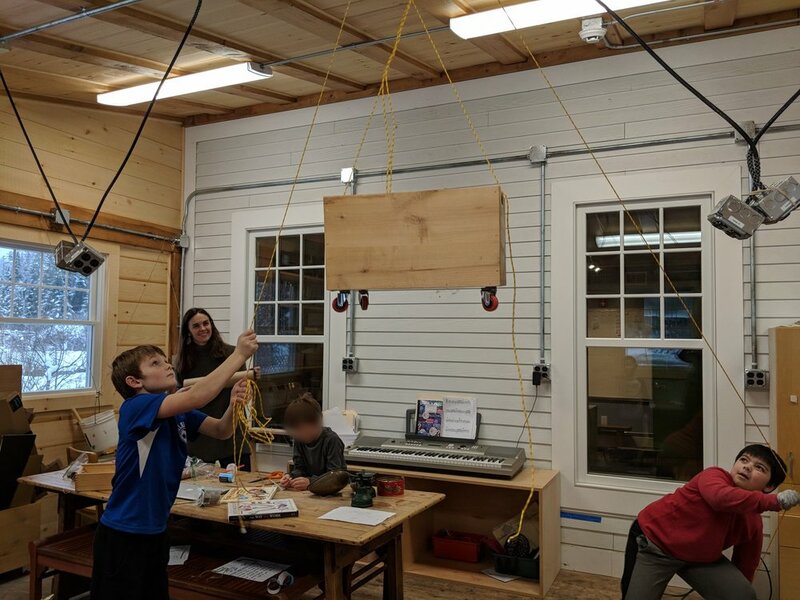 Students had to create a paper plan (using more than one pulley) and then, after their plans were approved, were allowed to visit the pulley 'Store' to 'shop' for their materials, and then they got to work building. Students were impressed by the loads they were able to lift with their systems. 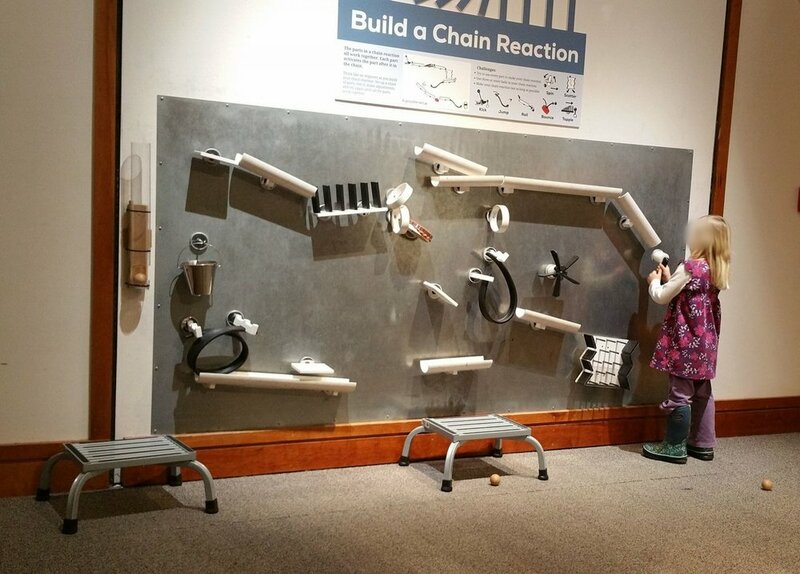 We concluded our week with a field trip to the Montshire Museum of Science, where the wonderful staff led the students through a balls and ramps workshop with the end result of creating amazing roller coasters. Students were then free to roam about the museum exploring the many other simple machines and other exhibits the museum has to offer.